Although scientists are uncertain whether climate change will lead to an increase in the number of hurricanes, warmer ocean temperatures and higher sea levels are expected to intensify their impacts. Recent analyses conclude that the strongest hurricanes occurring in some regions including the North Atlantic have increased in intensity over the past two to three decades. For the continental United States in the Atlantic Basin, models project a 45-87 percent increase in the frequency of Category 4 and 5 hurricanes despite a possible decrease in the frequency of storms. Warmer sea surface temperatures could intensify tropical storm wind speeds, potentially delivering more damage if they make landfall. Based on sophisticated computer modeling, scientists expect a 2-11 percent increase in average maximum wind speed, with more occurrences of the most intense storms. Warmer seas also mean more precipitation. Rainfall rates during these storms are projected to increase by about 20 percent and, as Hurricane Harvey showed in 2017, this can sometimes be the more destructive impact. Sea level rise is likely to make future coastal storms, including hurricanes, more damaging. Globally averaged, sea level is expected to rise by 1-4 feet during the next century, which will amplify coastal storm surge. For example, sea level rise intensified the impact of Hurricane Sandy, which caused an estimated $65 billion in damages in New York, New Jersey, and Connecticut in 2012. Much of this damage was related to coastal flooding. 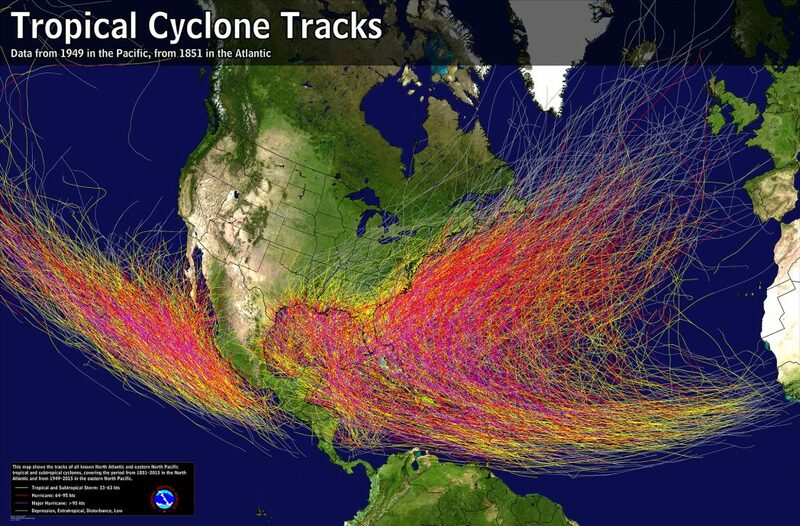 The connection between climate change and hurricane frequency is less straightforward. Globally, about 70 to 110 tropical storms form each year, with about 40 to 60 reaching hurricane strength. But records show large year-to-year changes in the number and intensity of these storms. Frequency and intensity vary from basin to basin. In the North Atlantic Basin, the long-term (1966-2009) average number of tropical storms is about 11 annually, with about six becoming hurricanes. More recently (2000-2013), the average is about 16 tropical storms per year, including about eight hurricanes. This increase in frequency is correlated with the rise in North Atlantic sea surface temperatures, which could be partially related to global warming. 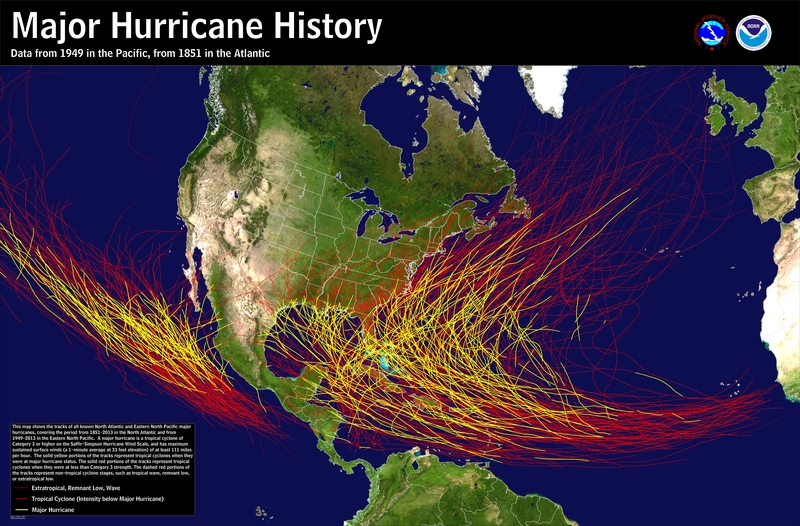 One trend analysis published in the journal Nature shows the strongest hurricanes have also increased in intensity over the past two or three decades in the North Atlantic and Indian Oceans. Other trend analyses that include all hurricanes globally are inconclusive, with upward trends in the North Atlantic and Indian Oceans and no apparent increase in frequency or intensity in other basins. For the 21st century, some models project no change or a small reduction in the frequency of hurricanes, while others show an increase in frequency. More recent work shows a trade-off between intensity and frequency – that as warmer oceans bolster hurricane intensity, fewer storms actually form. For the continental United States in the Atlantic Basin, models project a 45-87 percent increase in the frequency of Category 4 and 5 hurricanes despite a possible decrease in the total frequency of all storms. The National Hurricane Center categorizes Atlantic hurricanes based on wind speed. A storm with winds exceeding 74 mph is a Category 1 hurricane. Storms with winds stronger than 111 mph are considered “major hurricanes” (Category 3 or higher). Wind speed is just one of many factors that contribute to a hurricane’s impact. Others include its track (the site where the storm makes landfall), size, storm structure, rainfall amount, duration, and the vulnerability of the area it affects. Eight of the 10 costliest hurricanes on record in the United States have occurred since 2004. Damage estimates are still being tallied for 2017 hurricanes Harvey and Irma. Hurricanes Katrina (2005) and Sandy (2012) cost $125 billion and $65 billion respectively. Hurricanes Andrew (1992) and Ike (2008) cost $27 billion each. An important driver of the increased cost of hurricanes is increasing development in coastal areas. U.S. coastal populations grew by nearly 35 million people between 1970 and 2010. Coastal counties account for nearly 40 percent of the total U.S. population. As more development occurs in harm’s way — regardless of climate change — the more likely the damage will grow. Preserving coastal wetlands, dunes, and reefs to absorb storm surges. Replenishing beaches and improve infrastructure that affords coastal protection, such as seawalls. Elevating vulnerable buildings to reduce flood damage. Designing structures to be resilient to high winds and flying debris. Enacting policies that discourage development in vulnerable areas. Preparing prior to a storm’s arrival by boarding windows, clearing property of potential flying debris, and having an evacuation plan.